The theme of this year’s World Water Week, which runs from August 27 to September 1, is “Water and Waste: Reduce and Reuse.” World Water Week was established in 1991 and is organized each year by the Stockholm International Water Institute (SIWI). To mark World Water Week, we thought it only fitting to share a highlight of our July 2017 summer meeting—a tour of the unique Groundwater Replenishment System (GWRS) of the Orange County Water District and the Orange County Sanitation District (OCWD/OCSD) in California. SIWI promotes sustainable development in water governance and transboundary water management. In 2016, SIWI named WQ&HC’s Dr. Joan Rose winner of their prestigious Stockholm Water Prize. As described in their program, World Water Week 2017 will focus on United Nations Sustainable Development Goals 6 (Clean Water and Sanitation) and 12 (Responsible Consumption and Production). 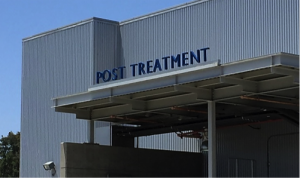 OCWD and OCSD have been leading the way in wastewater resource recovery and reuse in the U.S. for decades, so we were delighted to tour the facility, where photos and questions are not only welcomed, they are encouraged. Located in the heart of largely urban Orange County and operated by OCWD, the GWRS went online in January 2008. It provides “new, drought-proof” water for nearly 850,000 residents. 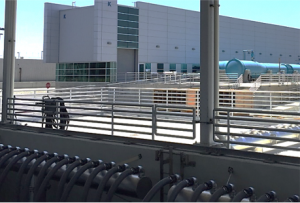 With an initial capital cost of almost $500M and annual operating cost of $40M, it is the world’s largest water purification system for indirect potable reuse.1 The facility takes highly treated wastewater from neighboring OCSD treatment plants and provides additional, advanced purification processes, including microfiltration, reverse osmosis and ultraviolet (UV) light with hydrogen peroxide. The final product is of near-distilled water quality that meets or exceeds all state and federal drinking water standards. In fact, the treated water is so pure that minerals have to be added back into the water to buffer and stabilize it post-treatment, prior to entering the distribution system. Approximately 35 million gallons per day (MGD) of GWRS water are pumped into injection wells to create a seawater intrusion barrier to safeguard Orange County’s fresh water supply. Another 65 MGD are pumped daily to OCWD’s “upstream” percolation basins in Anaheim, California. There, GWRS-produced water filters naturally through sand and gravel to the deep aquifers of the region’s groundwater basin to increase Orange County’s drinking water supply. 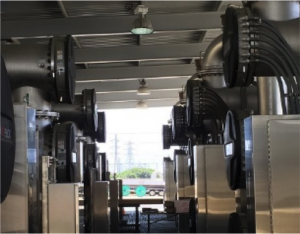 Although Orange County’s GWRS demonstrates that safe, efficient and affordable indirect potable reuse is a daily reality, other communities in California and around the world are confronting the technical and perhaps more daunting public perception challenges associated with direct potable reuse. 1 Blending of advanced treated, recycled or reclaimed water into a natural water source (e.g., groundwater basin, reservoir) that can be used for drinking (potable) water after further treatment. Colloquially (and derisively), the term “toilet to tap” also refers to potable reuse. 2 2017 UN World Water Development Report, Wastewater: The Untapped Resource. http://www.unwater.org/publications/world-water-development-report-2017/.